Once you’ve added accounts to Outlook, you can change how often Outlook checks for new email from each account as well as how often Outlook sends outgoing messages from each account. Select Send/Receive > Send/Receive Groups > Define Send/Receive Groups. Select the group you want to change. 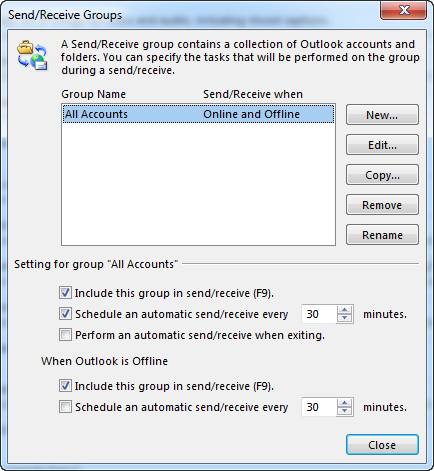 If you only want to send and receive mail when you press F9, clear the first Schedule an automatic send/receive every n minutes option.If you frequently work offline, and you check the second Schedule an automatic send/receive every n minutes option, Outlook tries to connect and send and receive your messages at the interval you specify. By default, all of your accounts are included in the All Accounts group. If you want to remove just one or two accounts from the automatic send/receive cycle, edit the All Accounts group and remove those accounts. This won’t affect your ability to send and receive messages to and from these accounts manually. Select All Accounts > Edit. Select the account you want to remove and uncheck the Include the selected account in the groupoption, then select OK.
To manually send email from an account you’ve removed from automatic send/receive, elect Send/Receive> Send/Receive Groups, and then select the account you want to send and receive manually.